As summer feels like it’s sliding away from the vacationer’s grasp, what better activity than to slide with it? Waterparks are burgeoning all over the USA (there are over 1,000 in the US, the largest concentration in the world) and terms like “zero entry pool” and “lazy river” are now common parlance for savvy water-bound travelers. The Resort’s Surfari Waterpark comprises main attractions plus an adult-focused spring pools area. The Waterpark’s features include the The FlowRider® Double, a surfing simulator open to all ages and skill levels (although you have to be at least 48 inches tall). There’s also the Dual Jungle Slides lazy river experience with water cannons, cascading waterfalls and an overhead bridge that runs 695 feet and a zero-entry pool surrounded by verdant Florida vegetation and private cabanas where you can get outdoor massages with fresh oranges and almonds and frangipani oils. There’s also a peaceful spring pool area, designed for adults but also open to kids where a quieter, more serene atmosphere prevails. The spring pools are within viewing distance of nearby Lake Austin, part of a large nature preserve. Expect to see herons and maybe even a flamingo or a pelican flying overhead. If you feel like going off property, but keeping the water theme going, consider a trip to nearby Gatorland, a 110-acre park where hundreds of alligators reign supreme. You can even zip-line over them. Our pick for experiencing these awe-inspiring ancient animals is the Gator Night Shine Tour where you get to shine flashlights into the glowing eyes of these Jurassic Park-era predators as you stroll a protected boardwalk. Parents who want time away can also plan on wining and dining at nearby locales like theQuantum Leap Winery and the Crooked Can Brewery. The Winery is Central Florida’s first urban winery and focuses on environmentally correct packaging (low carbon footprint vessels). Crooked Can Brewery features 16 beers on tap and is ensconced in the local Plant Street Market, perfect for an after dinner stroll. 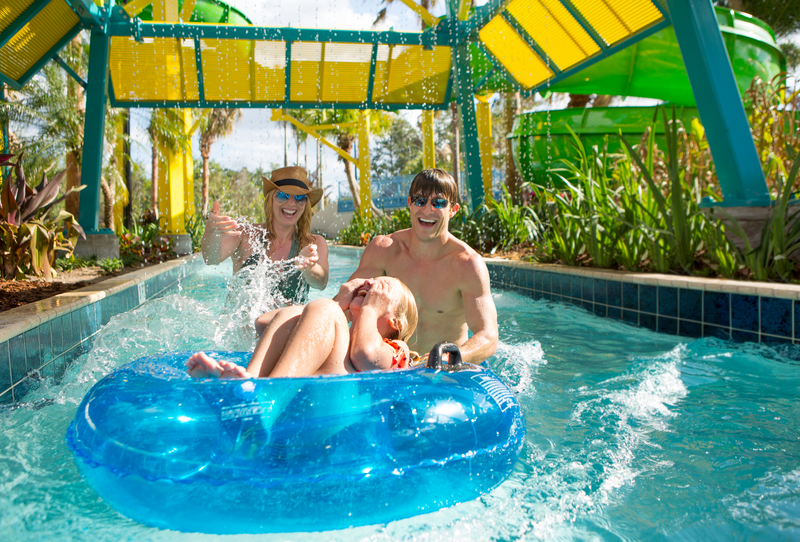 The Grove offers mid-to-end-of summer specials and package deals good for water fans (the waterpark is free for guests) and lovers of Florida’s lush, sensual delights.